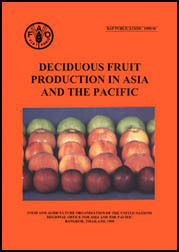 This publication brings together edited manuscripts of papers presented at the Expert Consultation on Deciduous Fruit Development in Asia, held in Bangkok, Thailand, 2-4 June, 1998. The Consultation was organized and sponsored by the FAO Regional Office for Asia and the Pacific. The Report of the Consultation was brought out in June 1998 (FAO/RAP Publication: 1998/10). The designation and the presentation of material in this publication do not imply the expression of any opinion whatsoever on the part of the Food and Agriculture Organization of the United Nations concerning the legal status of any country, territory, city or area of its authorities, or concerning the delimitation of its frontiers or boundaries. The opinions expressed in this publication are those of the authors alone and do not imply any opinion whatsoever on the part of the FAO.